A new edition in on-the-go-snacking for customers of either organically or conventionally grown produce is Crunch Pak’s peeled apple slices, which have been popular in baking recipes and with small children. 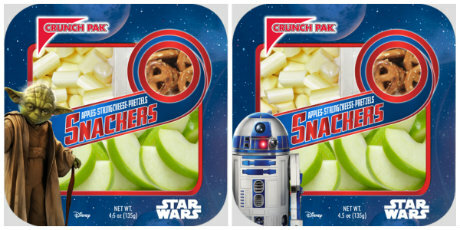 Their new Star Wars Snackers, also released late last year, include a snacking trio of sliced Granny Smith apples, string cheese, and pretzels. Crunch Pak was started in the year 2000 by a group of Washington state apple growers. All of the apples are grown locally in Washington in the Apple Capital region of the state. Since they’re locally sourced, keeping up with the demand of products can be a challenge. In order to solve this, another slicing facility was purchased recently on the East Coast and the company just recently purchased another local facility, solely for Foodservice production, to keep up with consumer and customer demands for sliced apples. “Crunch Pak products speak to a variety of demographics, depending on region and lifestyle, so we accommodate all audiences by giving them variety and innovative products,” said Krista Jones, Crunch Pak’s director of brand marketing and product innovation. 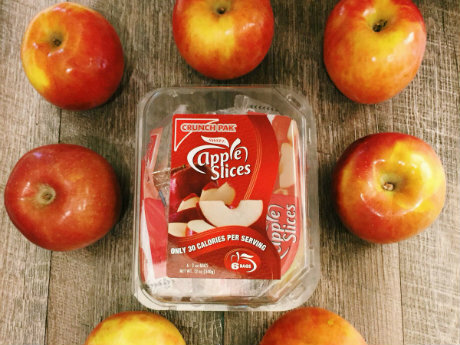 “For example, the foodie community loves our peeled apple slices for baking and recipes, whereas moms love our Snackers for their kids, and teens may gravitate toward one of the many traditional sliced apple varieties. We believe that innovation allows us to meet the unique needs of all our consumers.” Jones says that both conventional and organic product sells very well, and they will continue to provide a variety of organic and conventional product based on consumer demand. Crunch Pak products are available both in retail and through foodservice.